The use of penthouse style enclosures with circular evaporator coils is becoming an increasingly popular option. They offer the advantages of permitting coil insulation ABOVE the roof, rather than UNDER it. This means that neither the coil assembly, nor all the associated piping need intrude into the production space. The result: more usable volume for production and a more attractive final installation. Storage space and safety is becoming a growing concern in the workplace. This is a problem particular to large cooler and freezers, in that the volume of the storage area must be kept to a maximum, and the surface area of the walls and roof to a minimum. To solve the storage space problem, coolers and freezers are being fabricated with very high ceilings and products are being stored over 25 feet high. This presents a problem of where to place the evaporator coils and piping so as to not pose any safety hazards to the people working in the area, including installation and maintenance personnel. A solution to this problem is a penthouse enclosure which houses the evaporator on the rooftop. Malnar Industries has developed a penthouse for this particular application. The Malnar penthouse can be placed on the roof of a new or existing building, provided a hole can be cut in the roof and a level platform constructed to place the penthouse on. The Malnar penthouse is a sturdy structure; the whole penthouse is fabricated with a fiberglass shell surrounding a high density urethane insulation. The insulation measures 5.5” for a cooler application and 7.5” for a freezer. With the refrigeration system on the roof, no storage space is used by the evaporator or piping. With the coils and the resultant heat contained in the penthouse, there is less heat introduced to the storage room. Also due to the confined space the unit is located in, the time needed to defrost decreases, and the resultant heat from defrosting is contained in the penthouse. With the penthouse located on the roof, there is no need for inside pipping. The pipping can go on the roof, out of the way of forklifts. The valve station on the roof increase the ease of maintenance. There is no doen time while repairs are done on the storage area. There also is no danger of a leak in the storage area because the valve station is on the roof. Due to the natural flow of warm air up and cold air down, all the warm air is forced up into the penthouse, located in the upper most part of the storage area. This gives a better temperature along the ceiling and a more uniform air temperature around the room. 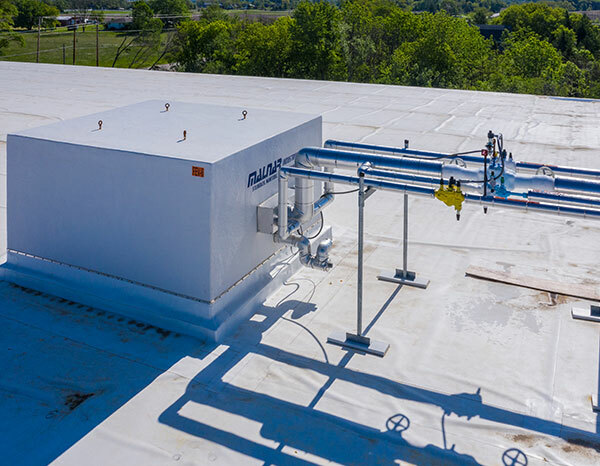 The penthouse can be placed over any area where there is a problem heat load, without having to move equipment in the plant. The penthouse, with its coil installed at the factory requires only one lift into place. Then flashing can be quickly installed around the outside and it’s complete. The rest of the work can be completed without interference with the day-to-day operation of the plant.